The cause of piercing “bumps”could be due to a number of sources of irritation or infection that can result in overgrowth of scar tissue when the healing process is disrupted. There may be a single, simple solution though it commonly may take a combination of protective measures to help this turn out well. Often a piercing done at an angle to the tissue other than perpendicular, or with a slightly irritating shape or material like steel or an alloy of gold (usually including copper, silver and trace metals) can cause irritation and prevent complete healing. You can stop by and have me switch it to a sterilized piece of anodized titanium jewelry made of certified implant material for better success. >> The shape, friction, and your sleeping habits could be the big issues. For these reasons I avoid overly loose fitted or ring shaped jewelry for healing most piercings. Stop by for a free consultation if you are in near my studio located at 4818 Lee Highway in Arlington, Virginia. I can provide you with an appropriate, attractive piece of implant grade jewelry. What seems to help the most and harm the least is gentle care as mentioned above and to apply a dry hot compress such as a heat pad set to medium or a hot washcloth in a Ziploc bag for a period of ten to fifteen minutes as frequently as once an hour up to bedtime, to increase circulation and build immune response. Make sure to put something absorbent such as sterile gauze in between you and the compress for a clean barrier. It may disappear as quickly as overnight if the irritation is dealt with, or it could take a few days. See your physician or dermatologist if symptoms get worse or do not clear up in the following few days after taking all the measures listed above. This could be an infection from streptococcus pyogenes or other germs. Hey Craig!! I stopped by about a week and a half ago with a pretty bad triple forward helix piercing I got done NC and you changed out the jewelry to titanium jewelry. 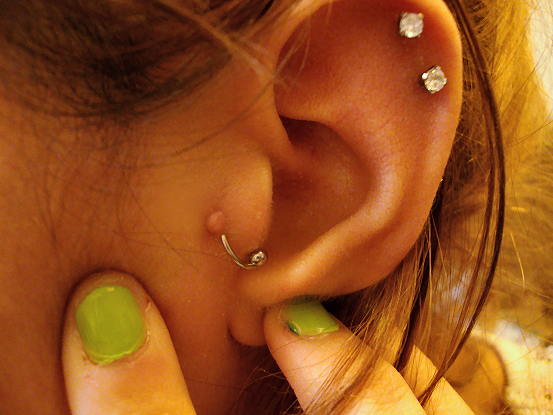 I must say that it helped a lot, but I still have bumps around the piercing. I remember you telling me about tips on your blog so I plan to try the heat compress. If that doesnt work then I look forward to seeing you again. Thank you for your care and expertise in helping me to solve this problem and make my piercing beautiful. I may be done with piercings, but if not you are definitely the man I’m coming to see. I’m happy to hear they are doing better! Try the compresses and if you want to stop in at some point and let me take a look, I would be happy to do that!